AAhhhh.! Life had been a crazy ride past few months. Beginning of a residency in surgery means end of many important things. Things thats define you, make you stand out. Things that you call your own. Habits that you love, people you couldn’t live without, passions that breathed life into you every morning. All that snatched away from you bit by painful bit. Anyways, but that doesn’t keep me from stealing some moments for myself and find peace in what I love doing. Exploring. I’m really glad to share that the picture above has made it to a group exhibition of amateur /professional photographers held in Pune which goes by the name Drushtikon.It’s held by members of Photographers @ Pune a thriving community of more than 5000 people spread all over the world.The exhibition is about bringing out the often missed but special, breathtaking moments we all see around us and frozen in the artists mind and lens. About the picture above : I feel jealous looking at the work environment of this gentleman. It’s a working day and he has the pleasure of basking in the morning light, opposite to most of us, who spend their day breathing recycled air, chained to cubicles. This picture was clicked in the lanes of Dharavi, the second largest slum in the world, and home to most of Mumbai. 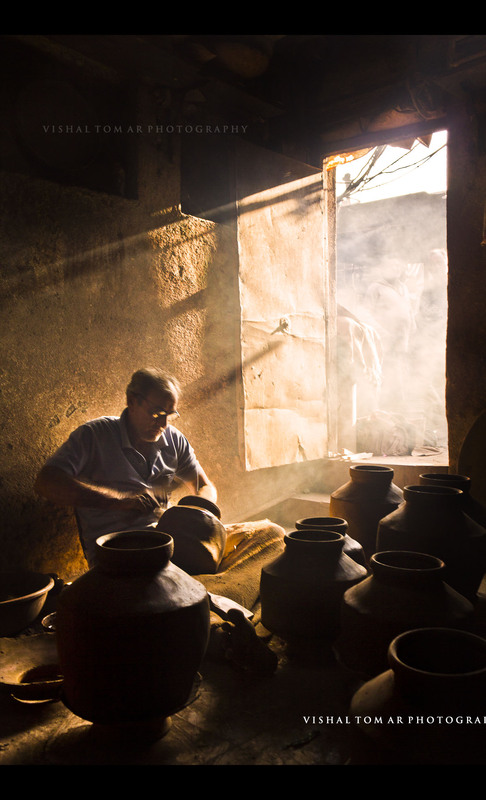 Potters of Dharavi are mainly migrants from other states like Gujrat and Rajasthan and earn their living by working round the clock making and selling earthen wares at minimal prices. Besides they are also an important ingredient of the “Bhelpuri” we call Mumbai. Hope to see you around : New art gallery, Ghole Rd. Pune. Previous The great Indian rope walk. It amazing the way communication works these days… I think, click a picture, tell a story, and instantly there’s an audience from another corner of the world…. Magic!!! Really appreciate the kind words..! Thanks. Lovely photograph, Vishal! Fabulous lighting. Applause! It’s quite worth appreciation …Following ur dreams and managing something hectic like surgery residency! Kudos to u! Hoping for some more master pieces! Cheers!